I'm shocked and disappointed that this book hasn't been talked about more, given how prevalent the issues of crime and imprisonment are today. While challenging the popular ideas reformers have about the causes and responses of mass incarceration, Pfaff provides fascinating insight and novel ideas for addressing our flawed criminal justice system(s). A totally necessary read. In the 1970s, the United States had an incarceration rate comparable to those of other liberal democracies-and that rate had held steady for over 100 years. Yet today, though the US is home to only about 5 percent of the world's population, we hold nearly one quarter of its prisoners. Mass incarceration is now widely considered one of the biggest social and political crises of our age. How did we get to this point? 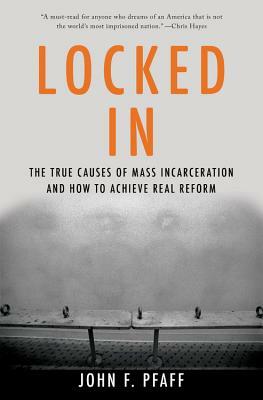 Locked In is a revelatory investigation into the root causes of mass incarceration by one of the most exciting scholars in the country. Having spent fifteen years studying the data on imprisonment, John Pfaff takes apart the reigning consensus created by Michelle Alexander and other reformers, revealing that the most widely accepted explanations-the failed War on Drugs, draconian sentencing laws, an increasing reliance on private prisons-tell us much less than we think. Pfaff urges us to look at other factors instead, including a major shift in prosecutor behavior that occurred in the mid-1990s, when prosecutors began bringing felony charges against arrestees about twice as often as they had before. He describes a fractured criminal justice system, in which counties don't pay for the people they send to state prisons, and in which white suburbs set law and order agendas for more-heavily minority cities. And he shows that if we hope to significantly reduce prison populations, we have no choice but to think differently about how to deal with people convicted of violent crimes-and why some people are violent in the first place. An authoritative, clear-eyed account of a national catastrophe, Locked In transforms our understanding of what ails the American system of punishment and ultimately forces us to reconsider how we can build a more equitable and humane society. "Pfaff, let there be no doubt, is a reformer...Nonetheless, he believes that the standard story-popularized in particular by Michelle Alexander, in her influential book, The New Jim Crow-is false. We are desperately in need of reform, he insists, but we must reform the right things, and address the true problem." "In the extremely important book, Locked In: The True Causes of Mass Incarceration and How to Achieve Real Reform, John F. Pfaff analyzes why America incarcerates more people than ever even as crime rates continue to fall... [he] also makes a compelling case that incarceration disrupts the lives of the incarcerated and their families long after they have served their time." "With rigor and specificity, John Pfaff sifts through the data to mount a convincing case about the causes of mass incarceration and the levers by which we can undo it. A must-read for anyone who dreams of an America that is not the world's most imprisoned nation." "An excellent overview of where America stands in regard to its prisons, and Pfaff's proposed reforms deserve serious consideration across the political spectrum." "Provocative and packed with data, Locked In will change how you think about what's wrong with the criminal justice system and how to fix it. A book that will be instantly integral to solving one of the country's most important challenges." "A refreshing look at the causes of mass incarceration, and is a must-read for anyone involved in the criminal justice reform movement. You may not agree with everything that Pfaff argues, but you will finish the book with a better understanding of the complexity of the problem and the need for solutions." "Timely and authoritative, Pfaff's discussion of mass incarceration provides a valuable and accessible addition to the prison reform narrative and an excellent analysis of the U.S. criminal justice system." "Pfaff offers a trove of evidence that [the 'standard story' of mass incarceration] is by and large wrong or, at the very least, misses much of the real story.